A brother who visits Singapore each year for meetings and prayers writes: In the heart of this small country, which is also a great metropolis, there is a small church, hidden behind some trees, which regularly opens its doors wide, thus becoming a humble and faithful sign of hope. It all began more than thirty years ago with the unexpected visit to Taizé of two young women from Singapore travelling in Europe. This simple visit was transformed into a stay that still bears fruit today. As an intercontinental team was preparing a meeting in Indonesia, Angela, who had come to Taizé shortly before, joined them. In 1984, in preparation for the Madras / Chennai meeting in India, the first stage of the pilgrimage of trust in Asia, several parishes and institutions in Singapore were visited by a team from Taizé. A small group formed, determined to participate in the meeting in India. These young people began to meet regularly to pray in order to be ready for this adventure. On their return, they continued to pray together, going each time to a church of a different denomination. After a few years, they discovered this small Armenian church in the heart of the city, and that is where they now meet every two months. These two words, “continuity and newness”, seem to express very well how the pilgrimage of trust is lived in Singapore. 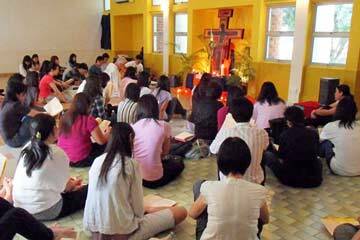 As far back as the 1970’s, two young people from Singapore spent some time in Taizé. Following that visit, one of them made herself available to help with preparing meetings in Indonesia. In 1985, young people preparing to take part in the Taizé meeting in Madras (India) started to pray together on a regular basis. During the early years the prayer was held in the churches of the different denominations. Finally, for the last ten years it has taken place in the beautiful little Armenian Church in the centre of the city. More recently, some of the young people have started leading prayers in their own parishes. 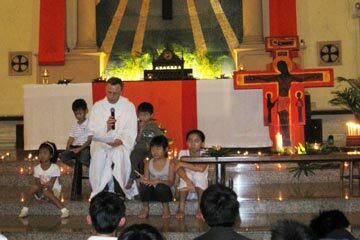 Young adults from Singapore visit Taizé, some of them stay for several months, and groups have taken part in the meeting in Kolkata (India) and more recently in Manila (Philippines). Brothers from Taizé visit Singapore every year, to lead prayers with the young people from the schools, colleges, universities, seminaries and the Theological College, as well as smaller gatherings for young teachers and catechists. On 14 May 2011, two of the brothers were invited by the Catholic youth ministry to lead a session of preparation for young adults who will be going to Madrid for the WYD. In the evening, they took part in the regular prayer at the Armenian Church. Several generations have now led this prayer. Young couples come with their children. It was beautiful to see how the musicians in the small choir were all very young. 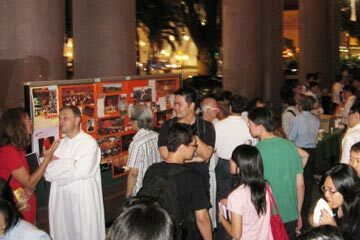 An evening of prayer was held at the Cathedral of the Good Shepherd, Singapore, on Friday 29 January 2010. The evening was part of the “pilgrimage of trust on earth”, international gatherings of young and not so young people organized by the Brothers of Taizé on every continent since the 1970s. Brother Alois, on his way to a pilgrimage of trust meeting in Manila, took part in the prayer at the cathedral. During the evening, he addressed the gathering. A group of some 25 Singaporeans took part in the meeting in Manila that lasted from 3 to 7 February 2010. This meeting was a new stage in the pilgrimage of trust, begun by Taizé’s founder, the late Brother Roger. 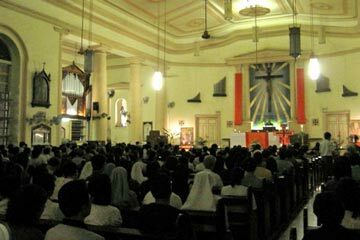 It was the fifth meeting of its kind in Asia, following meetings organized by Taizé in Chennai (Madras), India, in 1985 and 1988, Manila, Philippines in 1991, and Kolkata, India in 2006. The pilgrimage has as a general theme “inner life and human solidarity”. It was young people preparing to take part in the 1985 Taizé meeting in Madras who began to pray together on a regular basis at the Armenian Church, Singapore. That prayer has continued ever since and more recently young adults have started meeting in other parishes as well.